If you want to tick off your bucket list with the Sun Kosi expedition as one of your rivers to paddle then why you shouldn’t you? It’s great fun, bouncy and has exciting rapids. The Sun Kosi is the longest trip in river miles offered in Nepal and is rated as one of the top ten river expeditions in the world. 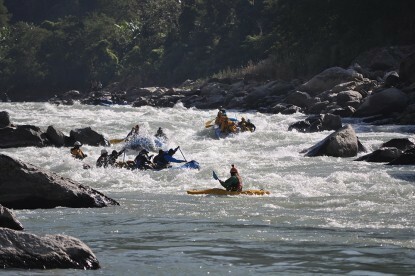 Starting near the Tibetan border and draining off the Eastern Himalayas all the way to the sacred Ganges River in India, this river offers big volume whitewater. A journey down this “river of gold” impresses any rafting or kayaking enthusiast with relaxing and sometimes challenging canyons, refreshing waterfalls, bat caves, interesting temples, beautiful white sandy beaches for setting up camp and of course a great variety of whitewater. If you are looking for a long river expedition with a nice variety of scenery and access to villages along the way, then the “river of gold” is a classic choice. Adventure Hub Nepal (AHN) also offer lots of trips with different combinations and durations on the Sun Kosi so please ask our friendly office staff about the choices you can take if you are on a tight schedule. 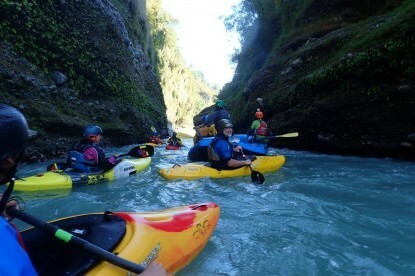 If you would like to get completely off the beaten track and seek an authentic travel experience and personal challenge, then this trekking and whitewater combination is a perfect epic adventure for you. 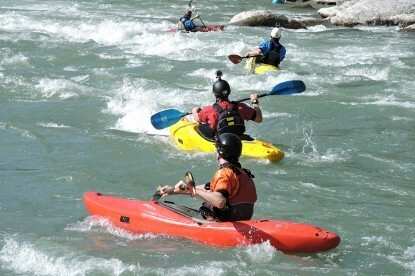 This trip is for one who likes to enjoy mountain views as well as do great whitewater rafting or kayaking adventures. This is the easiest of our moderate level lodge and tented trekking adventures and may involve walking for up to 6 to 7 hours per day. Maximum altitude is 3,000 metres and as the trek involves three days walking a total of approximately 45km a good level of fitness is required. The first day is a big day and we hope to cover a good distance on gently ascending and level hilly terrain on well-defined trails. On the second day, we start descending on well-defined trails that are steep and rocky in places. 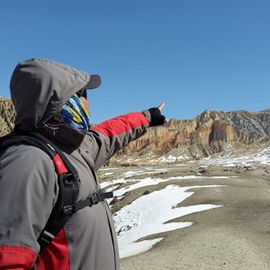 The last day is a half day trek covering approximately 8 kilomteres over mostl descending, somewhat steeply in places, on well-defined trails. Note: Its possible for people who doesn't have enough time for whole trip, you can do Sun Kosi Only or Trek & Tamur river Only just sent us email we can design itineray according to your needs. If you choose to spend additional nights you have to pay extra and we can recommend budget, deluxe or five star hotels depending on your needs. Of course, the prices will vary. Please let us know if you need extra nights’ accommodation and we can organize that for you. Nov 7th , arrival at Kathmandu and transfer to hotel. When you arrive at Kathmandu airport, you will be met by your Adventure Hub Nepal Expedition Leader and transferred to hotel to relax and recover from jetlag. We will go for a welcome dinner in evening and talk about the trip. 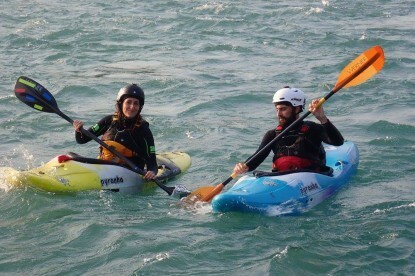 Today all the kayakers will go to the boat house to check out kayaks and fit them out to your liking. Day to yourself to explore Kathmandu. Visit Swoyambhu Stupa (the Monkey Temple - a favourite), The Great Boudha Stupa, Kathmandu Durbar Square or Pashupatinath Temple. After breakfast, we will take you to our private bus from your hotel which is 5 or 10 minutes and we will put all the bags for the whole adventure in the bus. We will drive approximately 3.5 to 4 hours to the put-in point of the Sun Kosi River at Khurkot. If we are lucky with the weather we might see some magnificent views of the Everest Mountain Range. On the river, we will warm up on beautiful class 2 - 3 rapids and ride a couple of larger rapids (class 4-) Punch & Judy, Pre-& High Anxiety. 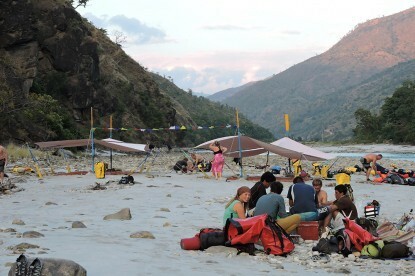 Camp on the riverbank, a nice sandy beach, above Hakapur probably the hardest rapid on the river. Included: Breakfast, Lunch, and Dinner. Nov 11th , Rafting/Kayaking Continues. Nov 12th , Rafting/Kayaking Continues. Nov 13th , Rafting/Kayaking Continues. Our last day on the Sun Kosi. Paddle down to the take-out at Chatra passing along the way the Bharah temple. At the take-out, everything is unloaded from our rafts and gear boats and loaded on to either the truck and or bus taking all our rafting and kayaking gear and anything else we don't need for the trek to Dobhan. Dobhan is the put-in point for the Tamur. Alternatively, pack some gear for the bus taking us to Basantapur which is the starting point for the trek. After organising all of this, we will go for a traditional dhal bhat lunch. With the truck and the AHN staff taking all our gear to Dobhan it means we can travel light on the trek. You just have to carry what you need for the 2 night 3 days trek – Drink bottle, thermarest, sleeping bag, minimal clothing, medication etc. 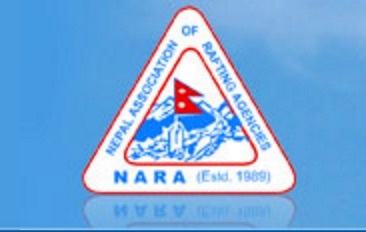 – we will have porters to help as required. After lunch, drive approx. 5.5 hours to Basantapur which is the starting point for the trek and stay the night in a lodge. We arrive at Basantapur and have dinner. Get organized for trekking leaving the next morning. Stay overnight in a lodge in Basantapur. After breakfast leave Basantapur (2,310m) begin trekking which will take you through beautiful woods and meadows with magnificent views of Makalu and the Everest massif in the far distance to the east and then Kanchenjunga to the west as we approach our destination Holy Lake Gupha Pokhari (2,890m). Stay in a tea hut overnight. It’s a full day today, expect to walk for 6-7 hours gradually gaining height and then leveling out - you will reach the top of the ridge at 2,980 meters – expect to cover approx. 26km today. Today you will continue trekking along the ridge through picturesque rhododendron forest and enjoy the spectacular views. The path winds gently up and down through ancient moss-covered trees. We then start to descend – steeply in places - and after approximately 5 to 6 hours. Set up camp near the village of Gorja (2,010m) – expect to cover approx. 11km today. Trek for approximately 4 hours or so (approx. 9km) down to Dobhan (640m) which is the starting point of the whitewater kayaking & rafting on the Tamur River. Pump up the rafts and get everything ready for the whitewater trip starting the next day. Relax and camp overnight on the riverside beach. The volume of the Tamur in November is around 5,250cfs (150 cumecs). 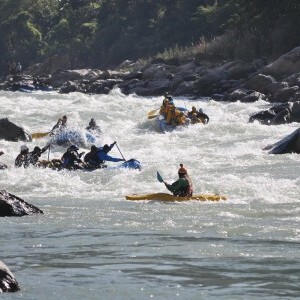 We will paddle approximately 115km to the confluence with the Sun Kosi and then a further 15km to the take-out at Chatra (100m) – approximately 130km (82 miles) in total. The Tamur River flows from the mighty Kanchenjunga mountain which is the third highest peak in the world. 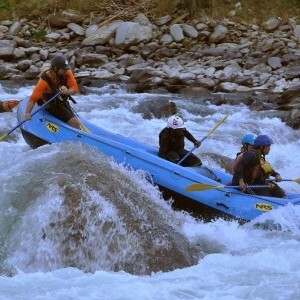 This trip combines fantastic whitewater and one of the most beautiful short treks in Nepal. It has spectacular views of Mt. Everest, Kanchenjunga and Makalu as you traverse along a ridge line at over 2,800 meters - 3 days trekking and 6 days rafting/kayaking. The river is a beautiful turquoise color and each day there are big volume rapids of class 3-4/4+. The river starts with a bang with 2 days of big volume class 3 to 4/4+ rapids. 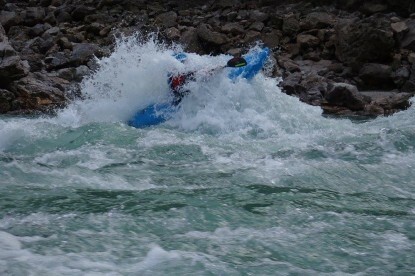 It then eases in the middle for a day or so with enough white water to keep you interested. It then finishes with 2 days of amazing class 3 to 4/4+ rapids – more rapids than you can count down to the confluence with the Sun Kosi. Camping is on beautiful sandy beaches along the river and there is plenty of time for exploring and beach volleyball. Nov 20th , Whitewater Kayaking and rafting on the Tamur River. Nov 21st, Whitewater Kayaking and rafting on the Tamur River. The last day of whitewater rafting and kayaking on the Tamur will take you down to the confluence of the Tamur and Sun Kosi Rivers. 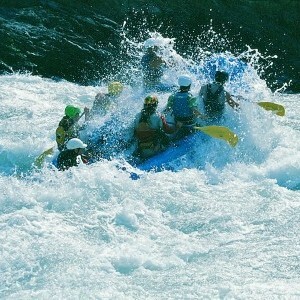 Over 30 rapids, of fun class 3 and 4/4+ white-water makes this a fantastic day of paddling. Camp at the confluence of the Tamur and Sun Kosi Rivers. Nov 23rd, Paddle down to the take-out of the Sun Kosi river at Chatra. Paddle down to the take-out of the Sun Kosi river at Chatra stopping along the way at the Bharah temple. Lunch in Chatra and then overnight bus trip back to Kathmandu approximately 16 to 18 hours arriving at approx. 7 am the following morning. NB: There is the option to take a 35-minute flight back to Kathmandu from Biratnagar which will cost approx. an additional US$ 250. Biratnagar airport is about an hour’s drive from the take-out at Chatra. The cost of the flight, an extra night in Hotel in Kathmandu, transport to Biratnagar airport and from Kathmandu airport to Hotel is all extra. If you are interested I am doing this, please let us know so as we can give you latest cost estimate. If you don’t have time and want to fly out of Nepal on day 17, you will need to take the flight from Biratnagar on day 16 afternoon to Kathmandu. You will be dropped off at your hotel, enjoy a nice hot shower and spend the rest of the day relaxing or shopping in Kathmandu. There will be a celebration dinner in the evening! Stay overnight in hotel. Nov 25th, Transfer to airport and fly home. Insurance requirements dictate that AHN must have medical confirmation before administering prescription medication on an expedition. In Nepal, this can be a difficult and sometimes impractical step in the first aid process. Therefore, AHN strongly recommends that clients bring their own personal drug kits (gastro kit) AHN Encourage you to go and see your travel doctor.​ AHN strongly recommend this year’s flu shot. Adventure Hub Nepal has been operating adventure holidays trips since 2007. Today we can help you discover whole Nepal and we can offer high-quality, excellent –value, small group adventure to your interested area of Nepal. Extend your holiday by booking some pre or post tour accommodation- ask Adventure Hub Nepal.